Location: Anglès, in the Tarn departement of France (Midi-Pyrenees Region). Notes: Château de Campan is situated in the municipality of Anglès in the Tarn department and the Languedoc-Roussillon region Midi-Pyrénées. The founder of the lordship of Campan is unknown. An ancient occupation is attested by the presence of dolmens, a menhir and standing stones on the field as indicated by IGN. Its dominant position gives it a lookout post on the Thore valley. Faced with the black mountain, it controls crossings since ancient times. 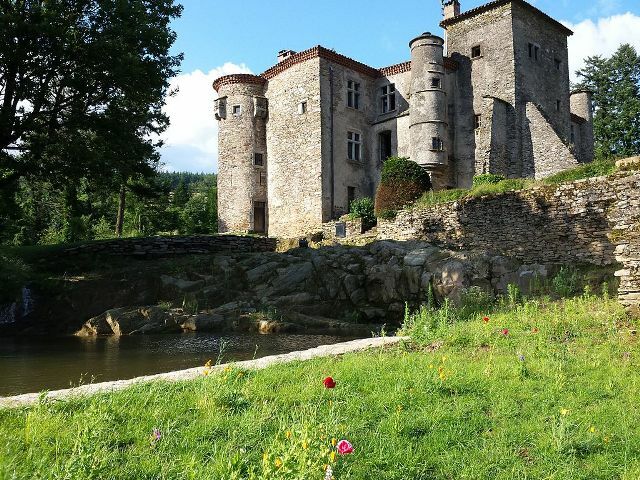 At once massive and delicate, Campan Castle is built in the eleventh century. It consists of a fortress flanked by three rectangular towers connected by a thick wall. It has a moat belt cut into the rock to ensure its protection. In the thirteenth century to complete the defensive unit a round tower with arrow slits and battlements is added to the northwest corner. In the fourteenth century building campaigns are continuing with the transformation of the courtyard in a covered building that form, since the bulk of the mansion. Its tower of oblong shaped staircase has a remarkable vis its size. In the seventeenth a beautification campaign brings its present facade and a tower watch tower at the southeast corner. Although the popular tradition associated with the Templars, the first lord of Campan whose name has ascended to us is William Citou. There lies the mid-sixteenth century. His son Jean-Philippe leaves a daughter, marquise Citou, who married William de Saix, from family residing in Carcassonne Castle Paulignan in Aude. The castle remains a century to Saix family Campan. Then, through the alliances, it goes to the family De Bedos, from Puylaurens, one of Jean Gaston heirs calls himself lord of Campan and Paulignan. He sees the Henri-Dominique Chevalier de Bedos Campan, infantry captain, engaged in the war for American independence. The lineage of this branch of Campan lords off with the disappearance of Lucie Dominique de Bedos Campan dies in Puylaurens in the late nineteenth century. Facades and roofs Campan Castle are listed as an historic monument by decree of 17 May 1961.